← Hurricane hits Britain – great for a tent test ! I have owned this tent for 18 months (purchased early February 2010) and was probably one of the first people to own this tent in the UK. In this period I have slept in the tent around 15 nights, not as much as I probably wanted to, but enough to give a good impression of the ability of the tent, its attributes and some of its shortcomings. I purchased this tent around six months before I started my blog and so some of the my trips and initial thoughts have not been posted. This was an easy tent to set up, although the end poles were always difficult to locate in the pocket at the top and very tight when the other end of the pole was inserted into the “ring” at the bottom. It seemed to strain the fabric a lot, but I thought at the time this was the tent design. During a trip around Grizedale Pike whilst camping in an exposed spot I tightened one of the end guy lines, to stop the flysheet flapping in the high winds. Unfortunately the end pole went through the fabric of the fly. I also found that the pegs securing one of these end poles pulled out on a regularly basis under high winds. In the end I had to decamp in the middle of the night to avoid the tent blowing away. As you can imagine I was pretty annoyed about the tent. Back home on the internet I tried to find out whether anyone else had similar experiences. It was then I found out through a post that the end poles supplied on some of the early purchases of the Power Lizard were too long. Instead of being 53cm they were 54.5cm . This is why the poles were always tight in the pocket located in the flysheet and ripped through the flysheet. Once I knew this and after a brief telephone discussion with Bob at backpackinglight (who was very helpful, even though he did not sell me the tent), I contacted the retailer to arrange a replacement. They suggested cutting down the poles to the right length and Mary repaired the rip so I could take it to a trip to the Lakes. In the meantime the retailer confirmed that they would take it back and replace it when I got back from the Lakes. During my conversation with Bob at backpackinglight, he talked me through some simple modifications which would in his opinion make a great deal of difference. My replacement arrived and I started again. The rest of the post relates to the new tent and the modifications I made. 1. I removed the silly fixed guy lines either side of the Power frame and added Dyneema guys with “line-loks” to get a much tighter pitch. 2. The 2 small Ti pegs supporting the small end poles have been replaced with 2 V-shaped Ti pegs, so the pegs don’t pull out in strong winds. The tent is extremely simple and quick to set up. It is a good idea to mark the centre of hoop pole and attach the middle clip of the Power Frame to ensure an even spread of the clips. Typical set up is about five minutes. The weight of the tent with my modifications is 1050g which is very light for a 2 skin tent . 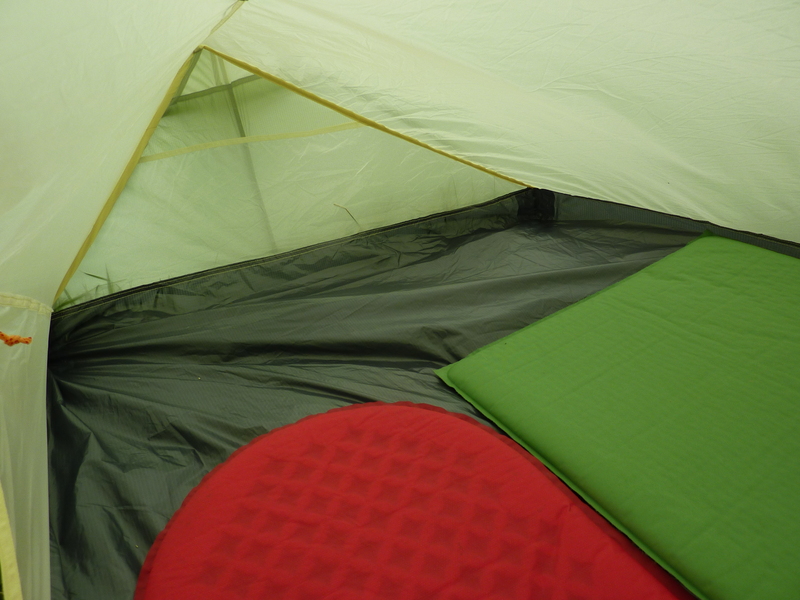 The tent is advertised as a 2 man and you can get two full size sleeping mats side by side. It is however a little tight for moving about with two. I have been out on a couple of trips with my youngest son ( he was fourteen at the time) and it was OK, but I would say that it is a one man tent really and it is a palace for one with loads of space. The inner tent has two good size pockets at one end. You can sit up in the middle without touching the roof and when lying down, my face does not touch the inner tent like it does in some tents. There is room at the foot end to store a 60 litre backpack and no gear needs to be store in the porch. The porch (vestibule) has sufficient room for cooking and if necessary you can detach the inner at one corner to increase the porch space. I would have like to have seen a two-way zip for the flysheet to allow ventilation when cooking in the porch. I have found that if you are not careful you can catch the material around the zip. Using one of your fingers ahead of the zip can avoid this snagging. With the modifications, the flysheet can be tensioned sufficiently to stop most of the flapping in the wind. I think tents of a single hoop design do suffer from this aspect, maybe less so with the Scarp 1 but this tent weighs nearly a third more than the Power Lizard. The Power Frame system keeps the single hoop pole rigid even in strong winds and I have tested the tent in winds up to Force 7 without problems. The Power Lizard has been waterproof throughout the period of ownership with condensation (not serious) occuring under certain conditions (still & cool) but due to the inner mesh I think it is better than similar designed tents. Like set up, taking the tent down is very simple and quick. Both the inner and outer remain clipped together and I just stuff the tent into its sack and away I go. Price: £370 RRP – can be found for £285 on-line. What I would recommend it for: 3 season lightweight backpacking or adventure racing. Can be used as a 2 man tent. I suggest that you do so only with family or friends you are very familiar with ! This entry was posted in Gear and tagged 3 season backpacking tent, backpackinglight, ultra lightweight tent, ultralight backpacking, Vaude Power Lizard Tent modifications, Vaude Power Lizard UL tent. Bookmark the permalink. Interesting review, informative, too, cheers! Thank you Art for dropping by. Used mine a couple of times. Noisy in the wind. Totally waterproof, quick to erect and take down. Room in there for me plus all my gear. Too cosy for two people or else your really good friends. Hi David thanks for dropping by. My mods have help I think with the noise. All in all an excellent tent for one for the weight. As you say, the Scarp is the only single hoop tent that doesn’t really suffer from wind noise, but is heavier. If they made an A frame at the opposite end to the door on the PL, it might cure a lot of the problems. Had I not gone for the Akto, Laser and Scarp, I probably would have tried a Power Lizard. Robin I have been thinking for a while if this type of mod would be feasible. Just need to find the time to sort it out. Great review.Can be purchased online for £245 at The outdoor shop in milton Keynes – seems a really good price. Thanks for your thoughts. You are right that is a good price. 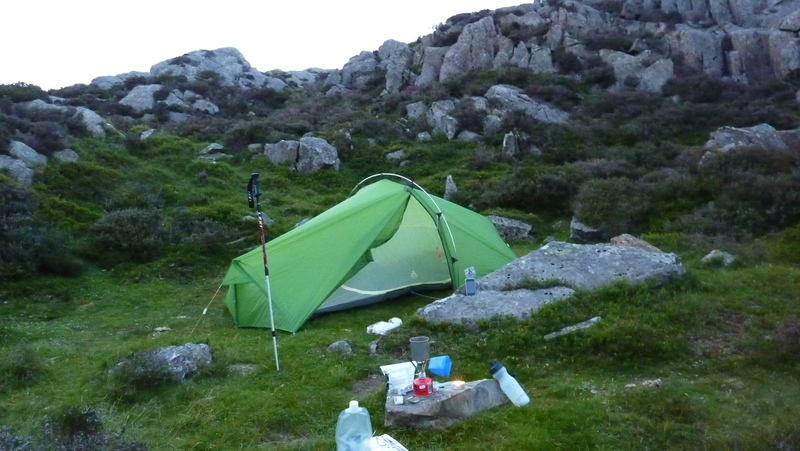 Good review, I briefly looked at this last year as well as a 2 man tent but was also put off by the lack of space for 2. Looks a very competent palace for one indeed. Thank you David. I think you you can share this with someone, but they need to be close family ! Am just wondering if these could be attached to the side walls ( one each side ) total of 4 . These in theory could reduce the blowing in , and only used in high winds . I know people have used them on tarps with success. I am also looking at the Terra Nova Solar Photon 2. This is a semi Geodesic , inner pitching first. I like a taught inner. Only weighs around 950 grams. Plenty of space. Has had some very good reviews , but Tera Nova sold out very quickly. Seems a very stable tent 3/4 seasons. rather stiff in use . Charles, thank you for your kind comments. I am pretty certain it was 1.5 mm Dyneema. I had considered the grippers. I think I will get some and see if they help. I will let you know. How are you getting on with your backpacks ? Plantar Fusciitis (Lovely name,spelling may be incorrect ! ) I was hoping this would be gone by now. But it least the delay has given me time to re-evaluate rucksack needs. from some stiff cardboard. Padding is a GG sitmat, as used in the Mariposa and Gorilla. modifications is around 650g , very light but not sure if as comfortable as the Lightwave.Will be ordering one from ULOG , so will have to compare the two. Re the grippers – may not work so well if Power Lizard is made of Silnylon.Am told may not hold so well, but could depend on angle of pull. Charles, my wife had Plantar fasciitis. Very painful ! I am back from a 47 km backpack over the weekend. I am still concerned that my Pinnacle needs to be packed carefully to be comfortable. I may look at the Lightwave myself. I hope you get back walking soon. The internal size vs. the weight looks really good! I wonder why there is no two way zip – that wouldn’t weight too much…? Seems a bit daft not to have a 2 way zip ! Nice review Mark. Interesting too – because some of your comments on particular design issues I’ve picked up on the Power Tokee UL. Like the tent door snagging. However, in the Tokee UL, there is a two way zip set up now. Can i begin by saying, how lovely to find your blog ! I came across it because i was doing some internet detective work re the power lizard. So im writing this to express my sincere thankyou(s): Your review really helped me decide to choose this tent in the end ( after a few stalled attempts & near misses ) & moreover, come back to yr blog because once purchased, i was keen to see who might be dharstedly enough to carry out any modifications. A Great review & good advice especially for some-one like me who’s caught the bug but lacks a fair bit of finesse, due to pretty minimal experience. At least that is something i can heartily look forward to amending. After reading the ‘about me’ section & enjoying some inspirational photos, reckon i’ll be downin a few brews as i revisit the blog and read on. Im plannin to walk as many of our National trails as i can and am slowly building a light-weight kit. This hasnt been that easy to do. Its a bit like Robert Persig, only now its zen & the art of back-packin. P.S. ive pitched the tent today, 1st time, to get my head around it, pitch it right & not hole it. I already love it & so long as its a force 7 i should b ok. Fare thee walkin well ! Rob, thanks for your very kind remarks and it is nice to hear that you have a Power Lizard. I think this is an under-rated tent, but I do know that people like Cameron McNeish have given the thumbs up and used it on a recent TGO. Also a well respected retailer and keen backpacker said to me that he much preferred it to the standard single hoop tents. I hope you enjoy it. oh, almost forgot, there’s a 2 way zip on the entrance ( fly sheet ) of the power lizard UL now. 12/04/12. It is a bu***r to open / close under tention so your other hand to hold the storm flap at bay and help ease the path of the zip works well. Takin your time doin it too, works really well ! Interesting,I know Vaude listened to some of the issues (this being one) that users and retailers brought up with them. I think you have to be careful with most tent zips and take your time. Thank you for that review. That helped me making my choice for a tent for cycle touring, so I went with the Power Lizard UL. I like it because it’s big and comfortable for its size and weight. But I am annoyed by some issues. 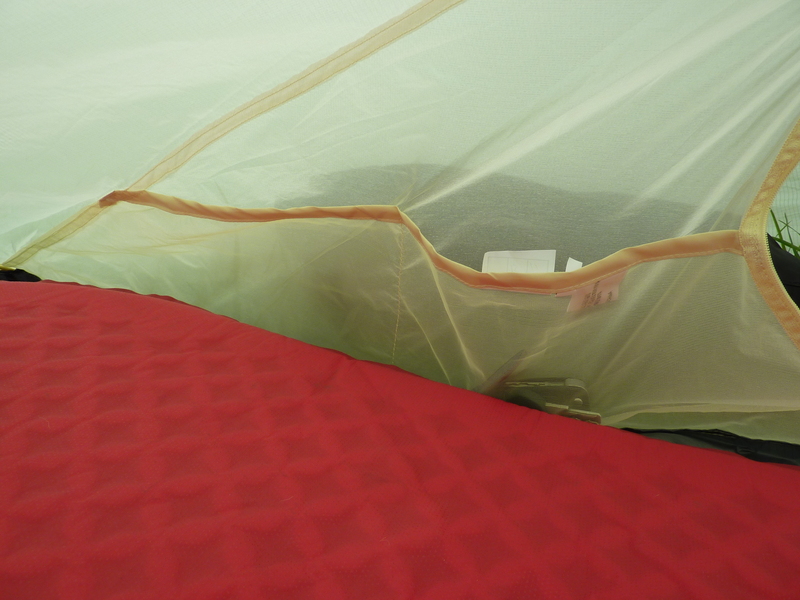 1) I have condensation inside the tent, little water droplets forming under the flysheet, even when I am not in the tent and when it’s not raining outside. It’s indeed not a problem as long as the flysheet do not touch the inner net (which happens with wind, regardless of my care when tensionning the flysheet). Would you have an explanation or trick? 2) I noticed the main pole is not symmetric: one end leg is longer than the other (see http://imgur.com/a/VkeTD). I don’t find it problematic, but just would like to know if you have the same, as they already did mistakes on pole length. 3) You can see at http://imgur.com/a/VkeTD also that one clip is already half-broken. It started after only 10 usages of the tent. I don’t force on it and try to have an equal tension in each part of the tent, so I don’t know (apart from bad quality) why this 1 clip broke. The problem now is that if I keep clipping it, it will break soon, and if I don’t, the 2 neighboring clips are undertaking more tension than they should do and I can feel they’ll start breaking soon. I emailed Vaude and the shop for a replacement … waiting for an answer. You clips are all OK? Just used my new Power Lizard 2-3 person for a two-night trek. No matter how I tried, I ended up with the flysheet touching the inner in at least one spot, even in very light wind. No rain during this trip, but some condensation. Any ideas how to prevent this? Stefan,sorry for the delay in replying. Not sure that I have had a problem with this. Obvious question – have you pitched it properly? Check the pitching instructions and see if you have missed something. 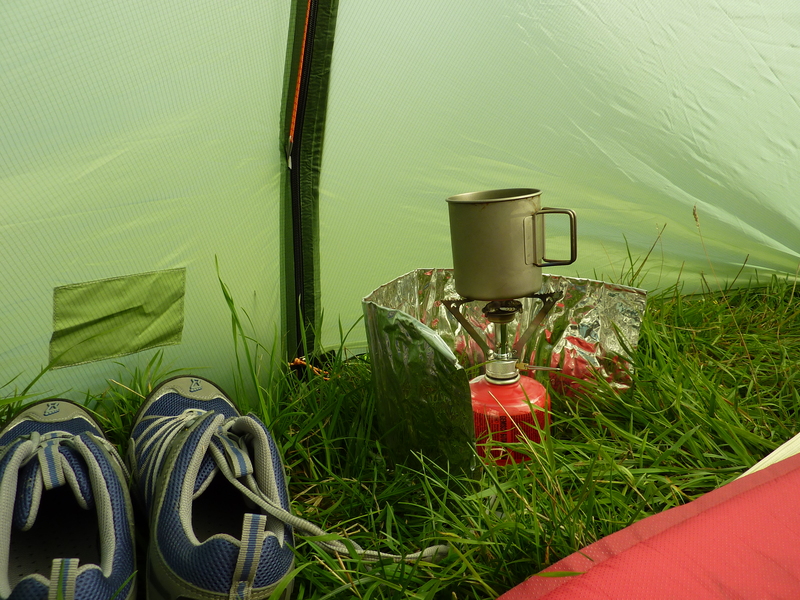 Like you, I have both a Vaude PL and a Hilleberg Soulo – both superb tents in their own way. The only thing that was bugging me (with both) is the oversized bag that comes with them. I can see the benefit of these if you were trying to quickly break camp on one of our not-uncommon midgie-infested, rain-soaked Scottish mornings but for the other times they’re more of a nuiscence. Iain, thanks for dropping by. I have done a similar thing, using an eVent stuff sack – it has a eVent panel in the bottom which allows the air out and and a small pack size. Hi Moa, thanks for dropping by. Real pity about your tent. Not had a problem with my Power Lizard. Hopefully yours was just a bad batch ! i´m going to buy one like this, if you don´t have better ideas ? is it possible to have photos´of your mods, my english is so lowsy that i´m not sure what changes you have made ? Hi Tipi, I will see if I can photograph the mods for you and post. waiting for pics and spring. I have been on two cycling trips to the French Border with Spain and back too Staffordshire with my PL tent in 2012 and 2013. I have done over 30 nights without any trouble from my tent. I did put 4 x 2 peg hoops on the bottom ( 2 on each flap )too keep the sides closer too the ground, and I also put a extra guide on each end making two from top of each pole. All this I did before I started on my trips. However having spent three days laid up in the rain I have decided on a larger tent. I have yesterday just received my 2-3P tent for this years trip. As this is only a few grams more I went for the same. I do also use my 1-2 PL in the Lakes and Dales and will still do so. Hi Mark, after a bit of searching i decided to buy a power lizard. Initially I was not impressed but it is growing on me. First pitch was shockingly loose, second one a bit better and after watching a few videos the third pitch was the best so far and I took a good look inside out (only garden pitches so far) I noticed the inner at the head (side where inside pockets are) the inner is not symmetrical (adjustable strap side shorter top centre to bottom and not a perfect triangle like other side) but the other side is? Also that same side on the outside does not get a tight pitch on the fly in that corner (corner with adjustable strap connecting fly and inner) which is making me think is it maybe a dud starting with the off centre inner? Hi Peter thanks for dropping by. Have a look at my post https://markswalkingblog.wordpress.com/2014/05/02/further-vaude-power-lizard-mods/ . This may help.